The New Radar Car is Simply Stellar. 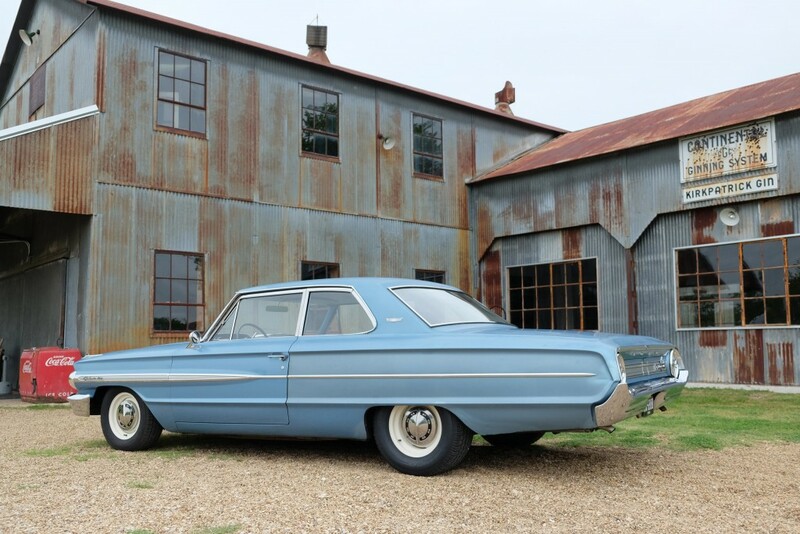 You may have seen a few FaceBook posts about our new Radar Car – a 1964 Ford Galaxie Club Coupe – that we picked up at the end of last year. Since we brought it down from its home in Pennsylvania, we’ve been going through it making sure everything works properly, fixing a few minor issues and generally sorting it out. We’re going to be putting a lot of miles on it and we like the idea of not getting stranded on back roads heading back and forth from car shows. Ol’ Blue as delivered at the end of last year. 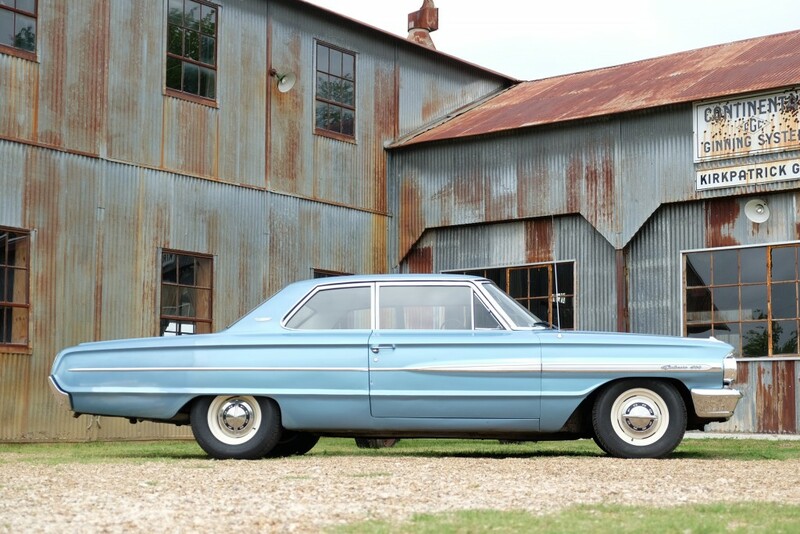 Everything about the Galaxie is amazing. It is all original, from the 91,000 miles on the odometer down to the patina on the medium metallic blue paint. Nothing has been changed or is missing. All the chrome bits are still on the car, the interior is in great shape with no rips in the seats, the AM radio works just fine and all but one dash light works. There’s evidence of some questionable body repair on the rear passenger quarter panel, and the passenger door needs to be realigned a little more, but overall the body is straight and solid. 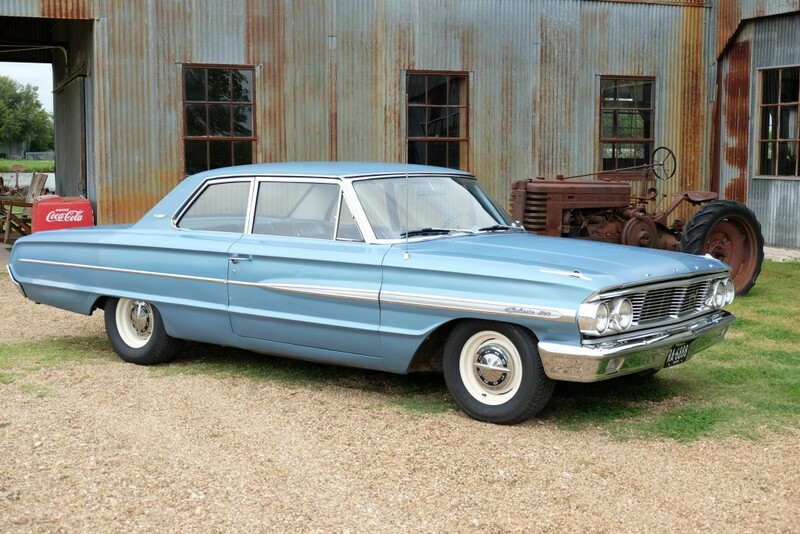 The Galaxie drives as it should – straight as an arrow with nary a bump or shudder getting in the way of a very smooth ride. Ol’ Blue glides down the road like she should. 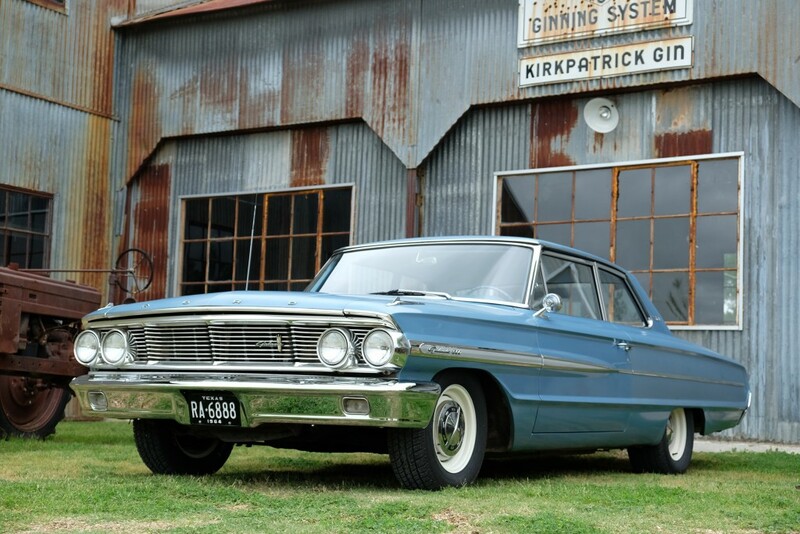 The backstory on the Galaxie is where this car really shines. We purchased it from our new good friend Bob G. in Oxford, PA. After spying the car for sale online we engaged in some back and forth emails, a few phone conversations and finally an agreement to fly up and view the car. Honestly, it turned out to be one of the best trips we’ve had in quite a few years and certainly the best old car purchase experience ever. Bob and Ol’ Blue in Oxford PA.
Meeting Bob in person was like being reunited with an old friend. He’s just an amazing nice guy. He lives in a beautiful part of Pennsylvania surrounded by Amish farms and rolling countryside, which made for great test drive territory. 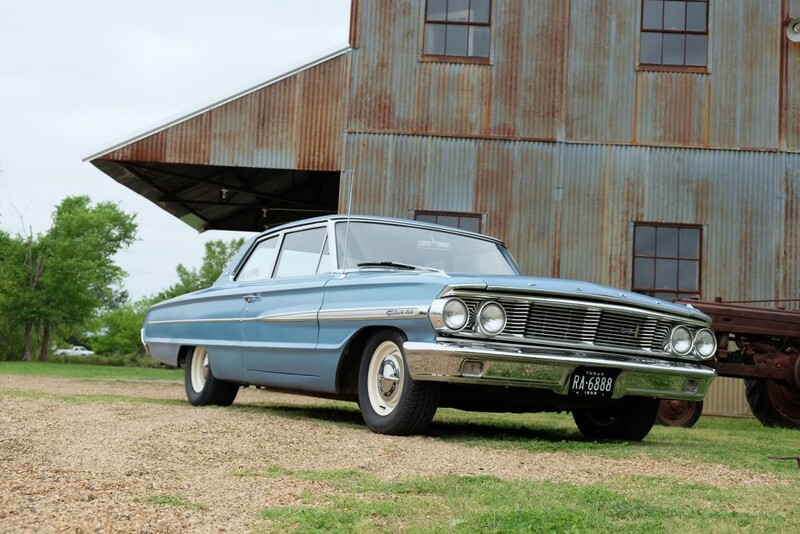 We poured over every inch and detail of the Galaxie and kept liking it more and more. Imagine finding an old car in Pennsylvania with no rust. No rust! The car had been garaged its entire life and never saw snow. After our extended test drive, we sat down with Bob on his amazing deck, drank a few home-brewed Pumpkin Ale beers (fantastic stuff!) and got the skinny on the car. Bob was the second owner of the Galaxie and had it for about four years. He purchased the car from the original owner, a good friend of his, around the time of the owner’s passing. The original owner always garaged it over the winters, finally parking it for good in 1990. In 2011 Bob bought the car and did some minor servicing to get it back on the road. After sitting for 21 years, all Bob did was drop in a new fuel tank, rebuild the carb, install a new water pump and put new Coker wide whitewalls at each corner. After that, he drove it on weekends to wineries and such. The patina comes from the car sitting in a garage with windows, which allowed for some uneven fading on different panels. But that’s the cool part about the car. It has personality. It shows as an honest survivor. The seats used to have clear plastic covers on them, and you can see where the cover pattern has been burned into the seat vinyl by the sun. Which makes it even more cool. Clear plastic covers protected the seats from everything but the sun. 1964 was one of those years that Fords had what we like to call ‘super power steering’. You can literally drive this car with one finger as the steering wheel, which is huge, turns so easily. Add to that the power brakes which take no effort and you’ve got a great highway cruiser. 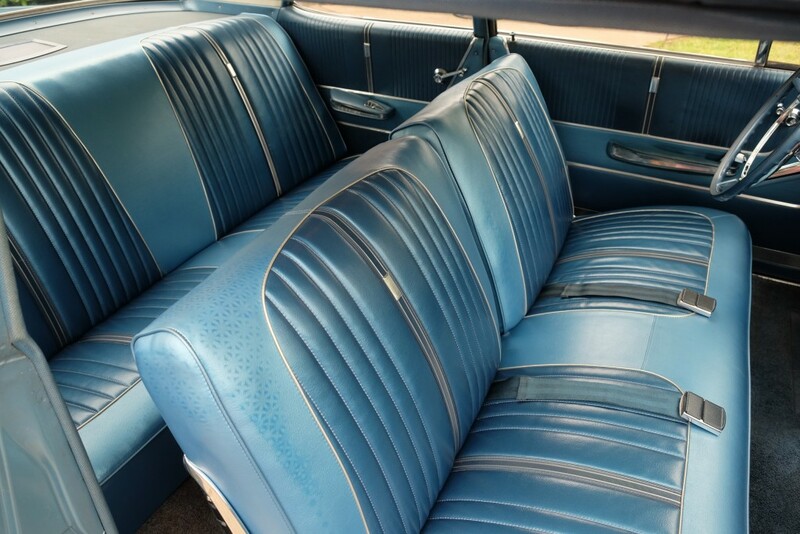 And then there’s the bench seat. You simply have to sit in an old sixties car to really appreciate one of these. It’s like driving your couch down the freeway. Comfortable, with just the right give. Makes you wonder why the auto industry no longer puts bench seats in anything other than trucks anymore. 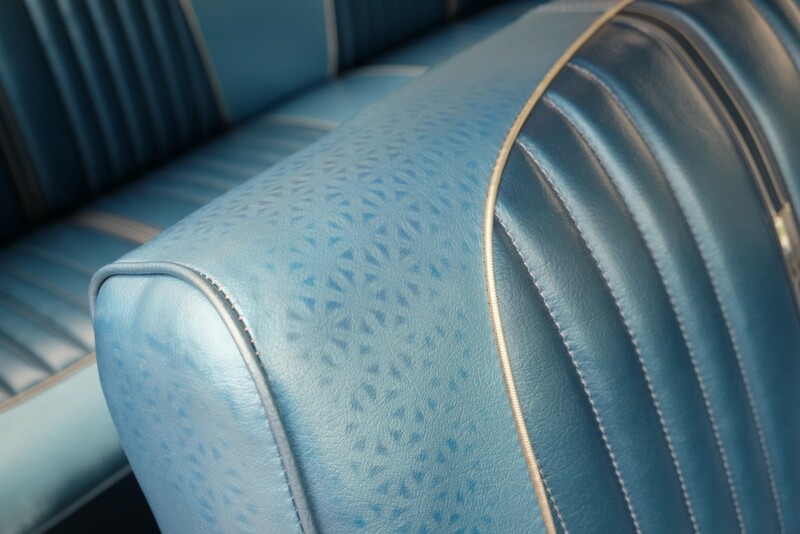 A seat made for cruising all day in Ford Trim 72 – Medium Blue Diamond Luster & Light Blue Diamond Luster vinyl. But let’s get to the reason why we’re here. After a lot of research and digging through photo archives, both print and online, as well as discussions with a lot of our gear head buddies, we finally decided what we wanted to do with Ol’ Blue first: Fix the stance. And fix it we did. The Galaxie came from the factory with color-keyed 14″ rims and iconic dog dish center caps. Back in the day, you only got 15″ rims if you opted for a big block motor. You know, 390’s and 427’s. We’ve got the 352 FE 4bbl engine, which is fine with us given its propensity for guzzling gas. Even at $2.00 a gallon, which we are thankful for (screw you OPEC! ), going to a car show means coughing up some coin. But with all the wheel and tire choices available today, how do you decide which way to go? Trust us, that’s what took so long to figure out. In the end, we decided we wanted a period-correct look for the first iteration of changes to Ol’ Blue. Since we are leaving everything else original we thought a simple tire/wheel upgrade would work best. We put 15 x 8 steel wheels with 275/60’s in the back and 15 x 6 steel wheels with 215/70’s in the front. Nice, meaty rubber that doesn’t give us any clearance issues, but, most importantly, gives us the stance that we wanted – just a little drop in the front. Period correct (mostly) and a cosmetic overhaul that really pops. And the rim color is the correct Wimbledon White for 1964. We love the new look on our new Radar Car. Baby’s got new shoes! And the extra grip makes it drive even better than before, especially when braking. 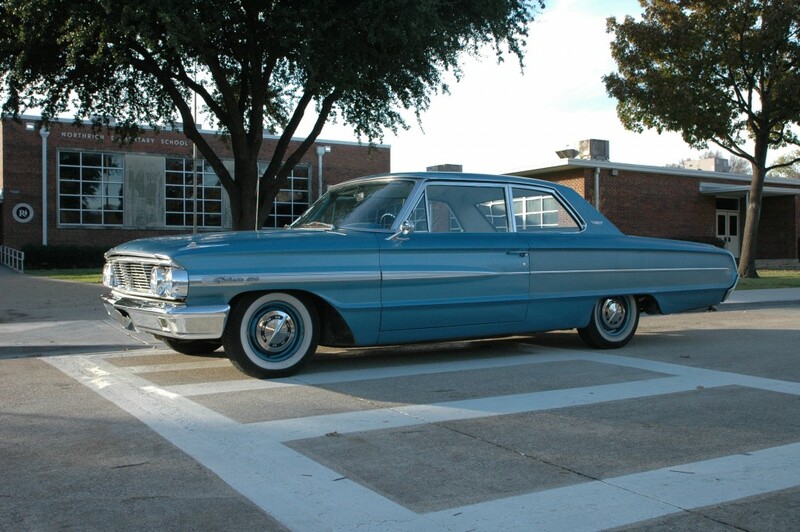 And judging from the reaction we get when driving it around town and down the freeway, we’ve done Ol’ Blue good. When a guy blasting down the highway in a new 2016 Mustang GT350 brakes to match your speed to give you a thumbs up, you know you’ve done something right. So what’s next for the new Radar Car? We’re going to take it to as many car shows as we can this year and put some serious miles on it. In other words – “Drive it like we stole it”. Why not? It has an AM radio and an under-dash A/C unit. What could be better? And when it comes time to make another change, you know we’ll keep you in the loop as we decide what to do next. In the meantime, here are some more shots of Ol’ Blue with the new wheel setup. Let us know what you think and we hope you like what we did. 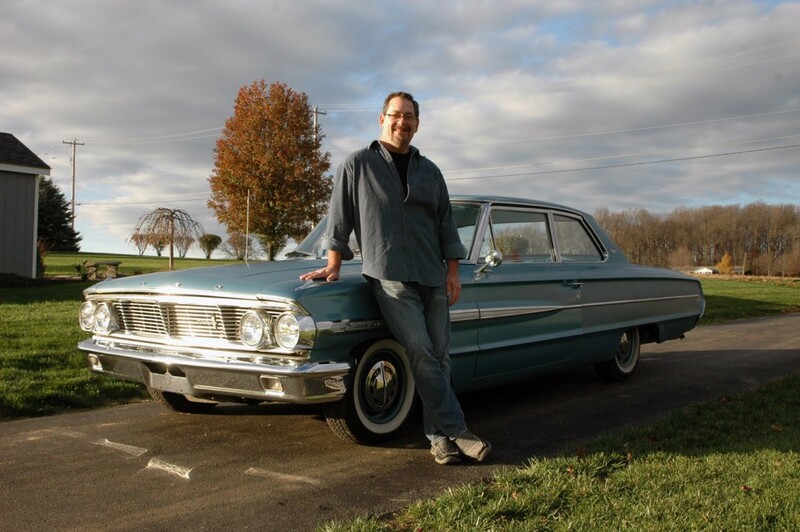 And special thanks to fellow car-nut Randy George for his help in traveling with us up to Pennsylvania to check out the Galaxie. Philadelphia will never be the same!